My son made his way into this big old world several weeks early and because he was premature he spent a couple weeks in NICU. My husband and I spent our days next to his crib talking to him about all the potential the future had for him, praying together, reading him stories and listening to music. At the time my big man was just a tiny jellybean, and like all infants he lacked the ability to express himself and his emotions. The first time I played music for him I saw him smile and since then he always has a visible reaction when we plug in our iPhones and let the tunes roll. He's always been a happy baby but he seems happiest when we let the room fill with music. Now that he's nine months old (gasp!) we can tell that his favorite types of music are instrumentals; anything from an acoustic guitar, marching band or ringing bells will do the trick. For me the problem with most children's music is that it's made for children. So even though my little guy loves it, I sit there cringing at the chipmunk-like voices and cheesy instruments. The perfect solution for our family is Jammy Jams. Jammy Jams takes hit songs that you already know and love and creates soothing lullabies. 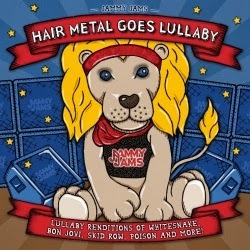 I'm a child of the 80's so I love the new album, "Hair Metal Goes Lullaby" with hits from Motley Crue, Bon Jovi and Poison to name a few. Even though the lullabies are great for baby, I find myself listening to them when I cook and occasionally at work. My personal favorite is Livin’ On A Prayer (originally by Bon Jovi). More importantly, my little guy loves the entire album. I highly recommend all you rocking mamas check out the album. To get you started Jammy Jams is giving you the opportunity to win a free download. Just complete the Raffelcopter entries below. Good luck!